Crash.net looks back at the 1994 Japanese 500cc Grand Prix, which cemented Norick Abe's status as one of the most exciting talents in motorcycle racing. If you ever wondered why Valentino Rossi nicknamed himself 'Rossifumi' in his long-haired, fairing-banging days in the smaller classes then you need look no further than Norifumi Abe's now-legendary stint at the front of his debut grand prix at Suzuka in 1994. Fresh from winning his national championship, Abe was catapulted into the international spotlight with a wild-card ride that drew gasps from racing fans around the world. At just 18-years of age, the Japanese rider seemed completely at ease mixing it with two riders who had won 34 500cc grands prix and a world championship between them at that time. Names like Crivill?, Barros and Cadalora could be called upon to occasionally give Mick Doohan, Kevin Schwantz and John Kocinski bother at the front of the top six but none of those exploded onto the scene quite as colourfully and memorably as Abe. Emblazoned in those now-legendary gaudy colours of the Mr. Donut Blue Fox Honda squad, Abe contested his first race with the gods as though he had spent a previous life beating them. The 7th of October marked the seventh year since Abe's untimely passing in a road accident and with the 2014 Japanese Grand Prix taking place this weekend, Crash.net takes a look back at one of MotoGP's most astonishing debuts. It's only natural for seasoned MotoGP watchers to yearn for the days when Suzuka was on the calendar. In comparison to the bland Motegi the track based three hours from Tokyo had a bit of everything for a rider; undulations, fast-flowing chicanes, sweeping corners taken in third, fourth or fifth gear, and - like Assen - a final chicane that guaranteed a last-lap braking duel. Riders loved it. Spectators too. And it was little wonder considering the racing that played out there from the series' first visit to the circuit in 1987. From then it witnessed memorable fights in 1988, 1989, 1991 and 1993. The '87 and '92 races were processions dictated by terrible weather conditions but the others were monumental in their own way. Schwantz took his first grand prix win there in '88. We saw his and Wayne Rainey's bitter rivalry play out in all its glory in '89. The top four riders were covered by just over half a second at the finish in '91. And both Kenny Roberts Senior and Rainey declared the latter's epic '93 triumph as the best in his career, as he lit up his rear Dunlop tyre and giggled under his helmet to the flag. Such sustained excitement can only be dreamed of at Motegi, a circuit that has arguably only produced one great battle for the lead in the MotoGP class. From its grand prix debut in 1987 the Suzuka layout remained unchanged. For 1994 the track was completely resurfaced, enabling a predictable level of grip that had been, until then, patchy at best. The new surface was reported to be worth two extra seconds a lap. Indeed Luca Cadalora's pole time was a second faster than the year before despite rain ruining Saturday's timed sessions. The class of '94 had an unquestionable 'end of an era' feel to it. Rainey's career-ending injury sustained at Misano saw him join fellow legends of the sport Gardner, Lawson and Mamola on the retirement list. Of those who excelled at the art of throttle control and rear-wheel steering that defined 500 riding in the eighties and nineties, only Schwantz and Doohan remained. Riders, much like today, who were picked from smaller grand prix classes now enveloped the grid, a far cry from the end of the previous decade. Before, those hoping to win in the premier class who hadn't cut their teeth in dirt track need not apply. America and Australia, the primary exporters of this style, dominated and from 1983 to '93 just five riders from outside the two countries won in the class, of which Cadalora was the only name to win more than once. By 1994 a background in dirt wasn't essential. Big-bang engine configurations, new low-lead fuel and improved tyre development meant rear-wheel steering was no longer a requisite to sit near the front of the 500 field. Crivill?, Barros and Ito could challenge for podium honours. But taking the fight to Doohan and Schwantz? Only Kocinski and Cadalora showed in the opening two rounds that they could be counted as outsiders for world championship tilts. The 'big three' Japanese manufacturers had endured less than exemplary season openings and by their home race had in some way reverted to older equipment. Suzuki, alarmed by an early sluggishness that was in complete contrast to Schwantz's title year, held emergency tests before Suzuka to compare their new chassis with the '93 model. It was reported that Schwantz chose the latter to race in Japan. Doohan wasn't satisfied with the direction Honda engineers had taken with the NSR and he wasn't afraid to let them know it. The Honda still boasted an eye-watering top speed but he and the factory were in the process of reverting the machine to the more rideable '92 specification, which had brought him such immediate success. Yamaha riders Luca Cadalora and Daryl Beattie turned their noses up at the proposed '94 chassis design, instead preferring the '92 ROC frame Rainey had chosen to run midway through the year before. Rainey's Misano incident impacted Schwantz in unimaginable ways but the reigning champion was handicapped further by a broken left arm, sustained in a mountain bike accident just three weeks before the season opener. The injury kept him out of the official IRTA pre-season test and limited him to a subdued opening to his title defence. By contrast Doohan's Assen injuries were improving as he spent the off-season having his leg straightened. Some were unsure whether the Australian could ever reach the heights of his form of two years before but in typical Doohan style, he was determined to prove them wrong. His opening to the year would have been happier had volatile American John Kocinski not taken a surprise win at Doohan's home race at Eastern Creek. In typical fast-starting style Kocinski led the series after two rounds with Doohan and Cadalora close behind. "Cagiva is the only team that has ever understood me," crowed Kocinski, a touch prematurely, after the race in Australia. By Japan, however, cracks started to show in his armour. Cadalora meanwhile had showed impressive speed towards the end of the previous year. Question marks remained over his temperamental mentality and whether it could cut it when up against Doohan's relentless consistency. 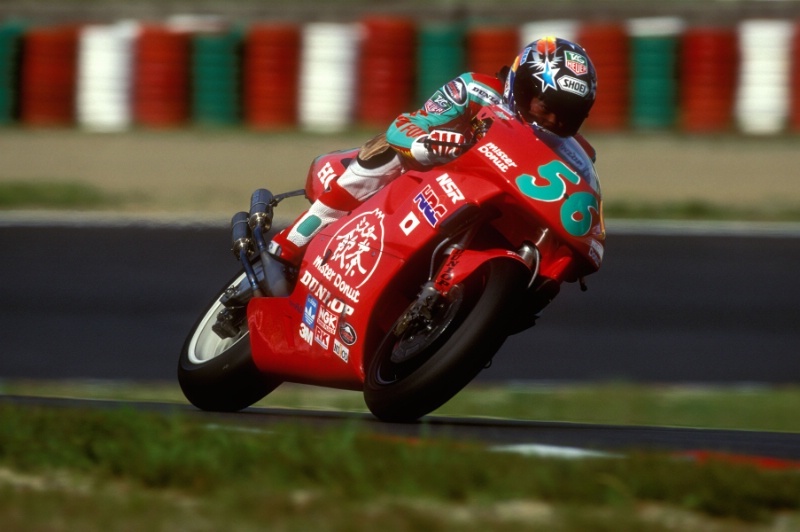 The big unknown was reigning Japanese 500 champion Norick Abe, making his first grand prix appearance as a wild-card on a factory-backed Honda. He had looked quick throughout qualifying, his unique riding style and retro pastel coloured leathers making him instantly recognisable. Hailing from Tokyo, Abe was raised on minibikes but travelled to California in 1991 to sample road racing and dirt track. Two years later he was the hottest property in Japan and, under the watchful eye of charismatic HRC leader Youichi Oguma, Abe was keen to move straight to the world championship in '94. Oguma believed it was best to stay at home and mature. Abe obliged, for the time being at least, knowing he had one opportunity to shine on the world stage. By midday on Sunday the showers that had spoiled the previous day abated and the sun was shining. As was the case in 1988, rain all but wrote off a day of qualifying, leaving the top men guessing at set-up for the 21 lap race. Abe's familiarity with the bike and track would play some part in his ascendancy to the front. The grid was based on times set on Friday - there hadn't been a dry session since. Cadalora was quickest out of the blocks, taking his second pole in the class ahead of Doohan, Schwantz and Yamaha's wild-card entry Toshihiko Honma. Abe started from the middle of the second row, behind Puig and Shinichi Ito. At his bequest Cadalora went with a soft option front Dunlop tyre. His strategy was simple - go like hell from the start. The Italian sprinted off the line to command a sizable early lead. Behind, the fast starting Crivill? fought off Doohan, Mackenzie - who jumped the start from the third row - and Abe. Schwantz was in a mire entirely of his own making. "I think I saw the third and part of the fourth row come past on the start," he said of his woeful get-away. He finished the first lap in seventh before making his way towards Doohan and Abe who had picked off the fading Crivill? to go second and third. By the close of the sixth lap Schwantz had manoeuvred his way to second and broken the lap record. Cadalora had led by three seconds - and half the start-finish straight - at the close of lap three but, thankfully for his pursuers, the grip levels of his Dunlop tyres began to plummet. As the trio honed in on the Italian, Abe started to make his presence felt, with quick fire moves on Doohan at the chicane on lap eight, then Schwantz two corners later, somewhat to their surprise. "I thought it would be between myself, Kevin and Luca and the possibility of Ito having a strong chance here. I wasn't quite sure about Abe," said the Australian soon after. It's not as though the grand prix fraternity were alien to seeing fast Japanese riders on fast bikes in Japan. Tadahiko Taira out-qualified everyone in sight in 1988 and 1989 but faded early in both races. It wasn't only Abe's prolonged speed that set him apart though. It was his age too. In contrast to the lanky teenager Doohan was 23 when he made his 500 bow. Schwantz was 22, two years before, Kocinski 21. "I don't think I was that brave when I was 18," Doohan later quipped. The Australian could be seen shaking his head several times after witnessing daring Abe moves firsthand. Not only was there a new name but a new style to admire too. Much of Abe's riding under braking was done perched precariously over the front of the motorcycle, his midriff arched upright over the fuel tank as he laid the bike on its side. The long, flowing hair protruding from the multi-coloured Shoei added to the image of a rider who held a blithe disregard for the reputations in front of him. One moment still stands out. Approaching the devilishly quick first corner, Abe out-braked Schwantz on the champion's inside. Arriving at what seemed like an impossible speed, Abe pushed his front end to the point of crashing but still made the corner, cutting the Texan off in the process. On the exit Schwantz looked over his shoulder, peering at Doohan, as if to say, "Who's this guy?" There were some hairy moments along the way, notably several huge slides through Dunlop Curve, one of which Abe saved on his knee. But he was the first to take the lead off Cadalora at the Spoon Curve on lap nine. The Italian was soon out of his seat, suffering a monumental moment through 130R, as he gave chase with his Dunlops screaming beneath him. Cadalora's fading was matched by slow-starting Ito's forward momentum. Soon a second Japanese would join the fight. 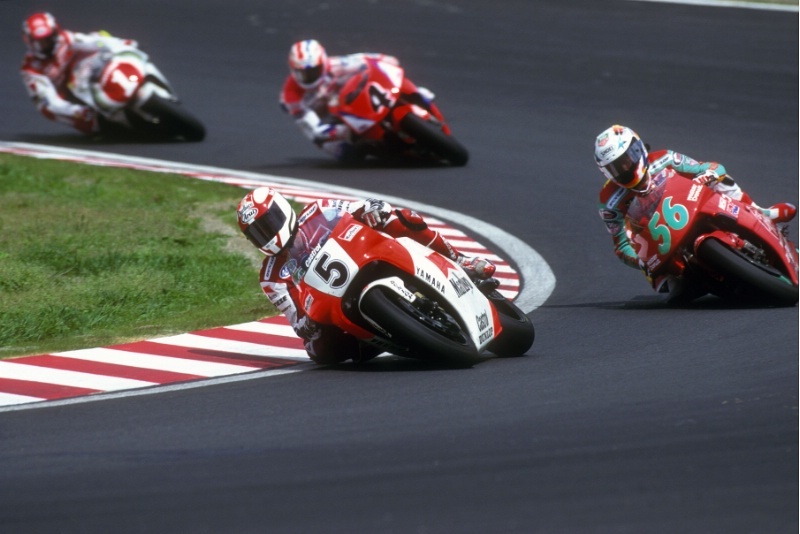 As Cadalora fell further from view, a second covered the quartet of Schwantz, Abe, Doohan and Ito. 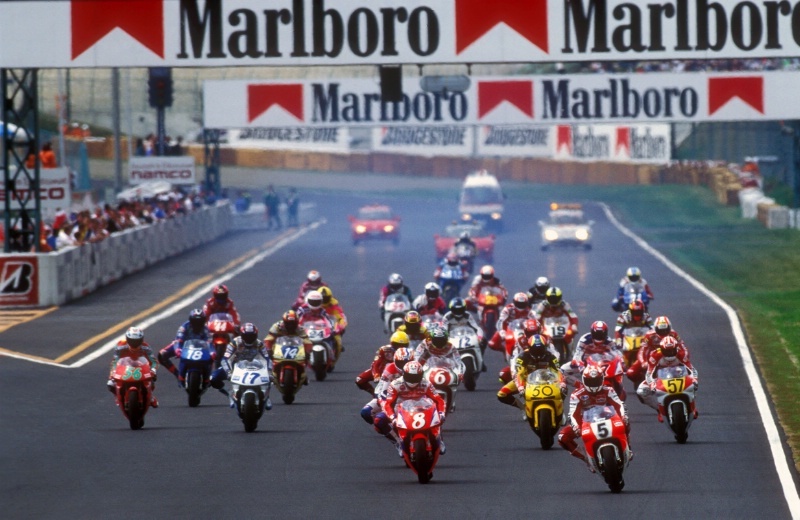 The front three all took turns leading with Doohan's Honda having a clear speed advantage. Schwantz's Suzuka prowess and Abe's late-braking ensured the battle was fought at an even kilter and the trio went at it for several breathless laps, the lead changing hands on countless occasions. By lap 16 Schwantz made the break. Doohan attempted to follow but was continually frustrated by Abe's late-braking moves. With three to go the teenager's naivety finally told. Schwantz was more than a second in front but Abe wouldn't give up. Braking later lap after lap into turn one his front tyre finally gave way and his debut race in the class of kings ended in a plume of dust. "I was sure I could have come second but I wanted to win," he said later in the paddock. From there the race was Schwantz's. He crossed the line three seconds clear of Doohan and seven of Ito in a result that breathed fresh life into his championship defence. "The Honda worked well... Kevin rode a heck of a race," a less-than-satisfied Doohan said to the TV cameras. He would use this disappointment to go on a devastating run of his own. The Texan revealed he hadn't considered any tactics. "It was just flat out." This was another vintage Schwantz performance, one that matched any of his three previous wins on Japanese soil. Just seven weeks before his championship was over before it had begun. Now he was reminding everyone why the number one plate was his. But even he was taken aback by Abe's speed. "There was a new Japanese rider in there who showed us a few things and kept us honest all weekend," he smiled. Abe's performance didn't just make an impression on the 72,000 fans sitting in the Suzuka grandstands. As the sun was dawned through a living room window in Tavullia, a 14-year old Valentino Rossi was bedazzled by the unfolding action. It left a lasting impression. "I remember for two or three months I always looked at the video of the race before I went to school," he said in 2007, soon after Abe's death. "I wake at 7am each day and looked at the video until Norick crashed and then I would go to school." Rossi would go on to reveal in his autobiography how he watched the re-run of the race on VHS so often it eventually wore the tape away. Abe's performance pricked the ears of team bosses, eager to find the kind of swash-buckling fearlessness on show that day. Although Oguma wanted Abe to wait for Honda's call, Wayne Rainey saw him as an ideal fit for his new grand prix team. Abe quit Honda several months later and went on to race twice that season - at Brno and Laguna Seca - in Marlboro Team Roberts colours as a replacement for Daryl Beattie. He finished a more than credible sixth both times. He was grand prix racing's next big thing. More than adept on a 500, Abe proved to be a more than capable podium runner, finishing inside the top three 17 times in the next eleven years. Suzuka would continue to be a happy hunting ground for Abe. He went on to claim two of his three grand prix wins at the track. Oguma naturally felt that Abe's career would have been more fruitful had he stayed with Honda. He used him as an example to Daijiro Kato - who took over Abe's Honda seat for the '94 Suzuka 8 Hours and was impatiently waiting for a world championship call-up from the 'Big H' in 1998 - so he'd wait his turn. The race was to be the penultimate triumph of Schwantz's career. He only beat Doohan one more time too -in that inspired Donington recovery later in the year - as injuries and a numbed motivation saw him finish some 148 points behind the Australian in a jaded title defence. It would be the following year's wet Japanese Grand Prix in which Schwantz truly realised his head was no longer in it, opting to call time on a sparkling career three rounds later. Doohan was far from happy on the Suzuka podium. One win from three was hardly ideal, yet he went on to win seven of the next eight races. He had the title won by the end of August with a typically dominant romp at Brno. The start of his own five-year dynasty was upon us. But for that one afternoon in Japan the focus wasn't on his Honda. Instead it was the red and green Mister Donut liveried NSR, sliding and skating its way around the world's best that burns longest in the memory.